Win a $20,000 trip for 4 people to experience the magic of Harry Potter in London! This once-in-a-lifetime trip includes economy airfares, 5 nights accomodation, meals & $2,000 spending money; PLUS a trip to the Warner Bros Studios Tour "The Making Of Harry Potter"! To get your entry code, simply purchase any Harry Potter product in store with your QBD Books Loyalty Card and enter the code into the above entry form. Information on how to enter and prizes form part of the terms of entry. Entry into the competition is deemed acceptance of these terms and conditions. This promotion is in no way sponsored, endorsed or administered by, or associated with Facebook, Instagram or Twitter. By entering and participating, entrant agrees to hold harmless, defend and indemnify Facebook, Instagram and Twitter from and against any and all claims, demands, liability, damages or causes of action (however named or described), losses, costs or expenses, with respect to or arising out of or related to (i) entrant’s participation in the competition, or (ii) entrant’s participation in any Prize related activities, acceptance of a Prize and/or use or misuse of a Prize (including, without limitation, any property loss, damage, personal injury or death caused to any person(s). Competition is open to Australian residents only. Participants cannot be an employee of QBD Books. Entrants are required to take full responsibility for the content of their entry and for ensuring that their entry complies with these Terms and Conditions. For the purposes of these content requirements, “entry content” includes any content (including text) that entrants submit in connection with their entry into the Promotion. QBD reserves the right to verify the validity of entries and reserves the right to disqualify any entrant for tampering with the entry process by submitting an entry that is not in accordance with these Conditions of Entry. Entrants must have purchased a Harry Potter product in store or online with their QBD Books Loyalty Card and retain proof of purchase to be eligible to win. Entrants can enter this competition multiple times if they have made multiple eligible transactions per the above. Entries open 8am AEST 1/9/2018. Entries close 5pm AEST 31/12/2018. No responsibility will be accepted for late or misdirected entries. All entries are deemed to be received at the time stamp on the entry in the QBD database. Any entries submitted outside the promotion time and date parameters outlined above, or after the promotion period has closed, will not be included in the promotion. All entries will be the property of QBD Books. The information entrants provide will be used by QBD for the purpose of conducting this promotion. The winner will be the first valid entry submitted in accordance with these Terms and Conditions that is drawn by QBD Books by random computer selection at 7/1/2019 at QBD Books Headquarters, 30 Enterprise Street Richlands Q 4077. In the event of any technical difficulty the winner will be chosen by a representative of QBD Books at QBD Books Headquarters, 30 Enterprise Street Richlands Q 4077. Winners will be drawn by 5pm AEST on 7/1/2019 and notified by email within 24 hours of the draw. In the event that the prize notification email is returned as undeliverable, such prize will be forfeited and an alternate winner will be selected from all remaining (non-winning) eligible entries. Winners may be named on QBD Books’ website, social media channels and e-newsletter. QBD Books’ decision is final and no correspondence will be entered into regarding the competition result or any other decisions QBD Books makes in connection to the promotion. Prize must be claimed by 5pm AEST 21/1/2019 or competition will be redrawn. The prize will be awarded to the person named in the entry. However, in a dispute, will be awarded to the account holder of the entry mechanism used to submit their entry (i.e. The QBD Loyalty Card account holder). Should an entrant’s contact details change during the promotional period, it is the entrant’s responsibility to notify QBD Books. A request to access or modify any information provided in an entry should be directed to QBD Books. Total prize pool value is up to $20,000 (including GST). 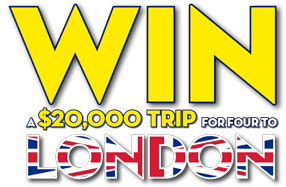 One winner will receive a holiday to London, Great Britain for 4 people including: Economy flights & 5 nights accommodation, travel taxes, airport transfers, meals, $2000 spending money and a day trip to the Warner Bros Studios London Tour – The Making Of Harry Potter. Any travel companion under 18 years of age must be accompanied by their parent or legal guardian at all times. Travel insurance, passports, visas, transport to and from departure point and all other ancillary costs, as well as obtaining any of these, are the responsibility of the winner. The winner is responsible for ensuring that they and their travelling companion(s) are fit to travel and have received appropriate health checks prior to taking the prize. All components of the prize must be taken together or otherwise are deemed to be forfeited. Travel is subject to booking availability and black out periods may apply. The prize must be taken before 31/10/2019 and the winner must provide QBD Books with selected travel dates. The winner must give 60 days notice to QBD Books of travel dates selected to allow adequate time for travel to be organised. In the event a winner does not take the prize by the time stipulated, then the entire prize will be forfeited by the winner and cash will not be awarded in lieu of the prize. The prize cannot be transferred, exchanged or redeemed for cash. The winner acknowledges and accepts that any activities that form part of the prize are inherently dangerous and may result in death, injury, incapacity, damage to property or other losses. The Promoter is not responsible for any acts of god, such as adverse weather conditions or industrial action or civil commotion that may take place. The winner must make his or her own enquiries about local issues and conditions at the destination prior to travel.